← Let’s Have A Raffle! Porchetta is typically a fatty, stuffed, and rolled pork roast that is slow cooked. 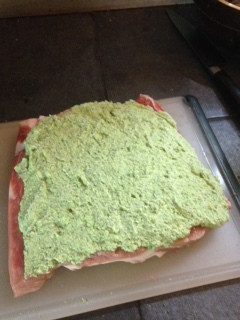 We ground up the shoulders from the last pig we butchered (gotta make salami out of something!) so I had to dig around in the freezer for a different hank of meat. Normally, I just turn the loins from the pigs we butcher into back bacon (Canadian bacon if you must), but this time I wanted to try something different. 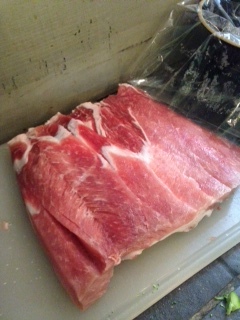 I took the boneless loin and cut it with a very sharp knife to try to get the entire thing to be about 3/4″ thick. This will essentially ‘unroll’ the piece of meat. If you start wondering if this might be a little easier if the meat is still partially frozen, let me save you some time. It is not. 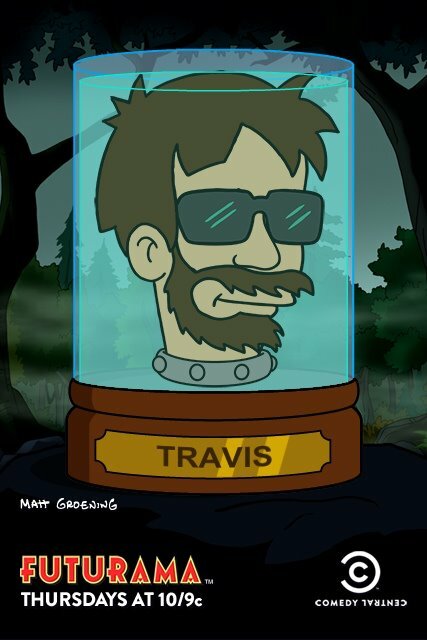 Don’t make my mistake, wait until it is fully thawed. I chose one of the fattier ends of the loin just because I knew I would smoke it for a few hours and I didn’t want it to dry out. 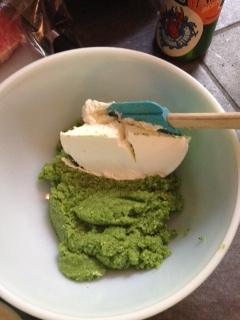 For the stuffing, I chose broccoli and onions blurred into a paste in the food processor and then mixed with some ricotta cheese. It made sense at the time. Then all I had to do as smear it all over the meat. Once that was done, it was time to break out my…uhhh….rolling skills. Please fight the urge to lick the end to seal it closed. Use Butchers twine instead. I didn’t even need to use a dollar bill. 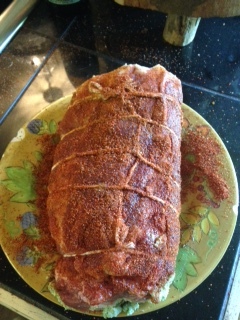 I mixed up a little dry rub with brown sugar, salt, paprika, and some other stuff because it looked like it needed it. All that was left was to smoke this beast. As I usually do, I cut my smoking into thirds. First third is with oak, second is hickory, third is cherry. 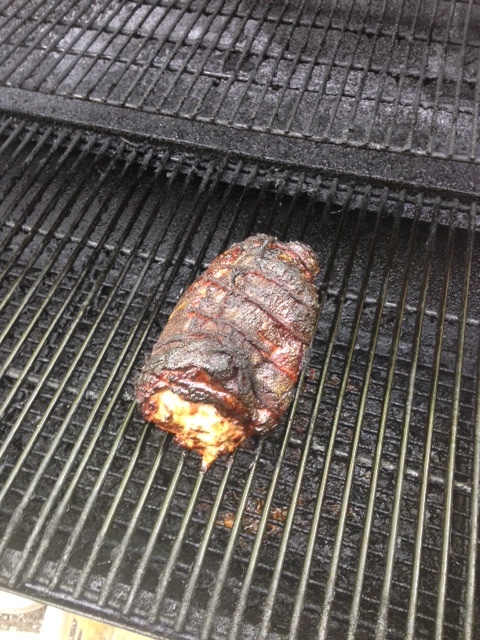 I think this creates the most delicious blend of smoke flavor on pork, but use whatever wood you want. I smoked it for 4 hours at around 250. Being a leaner cut of meat it didn’t need the 8+ hours to break down a bunch of connective tissue but you still want to to go slow in order to get a good smoke in there. It turned out pretty tasty. If you look at the picture above, I don’t have a clue why the filling wasn’t spiraled inside there. Its something I will pay more attention to next time. Also, the meat was a touch dry. I think that’s an effect of using the loin. It just doesn’t have the fat content needed in order to be cooked the way I did it. 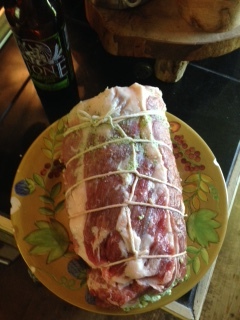 Next time I will brine the meat first if I use a loin again. Overall, it was a successful project. It made my mouth very happy. Next time I’ll make the few changes I mentioned and see how it goes. 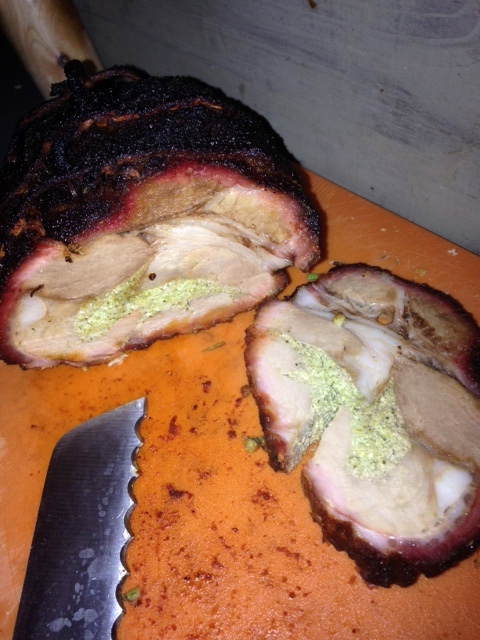 This entry was posted in Meat Stuff and tagged broccoli pork, loin, Meat, pig, porchetta, Pork, pork loin, recipe, smoke meat, Smoking, stuffed loin. Bookmark the permalink.